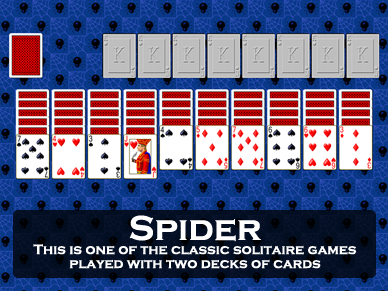 Screen shot of the game Barney's Spider from Pretty Good Solitaire. Barney's Spider is a variation of the popular spider type game Fred's Spider. 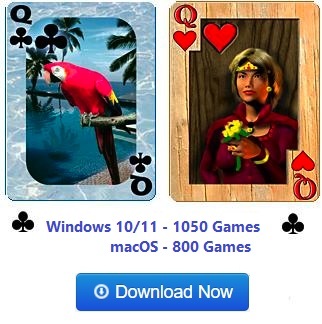 It is a two deck game. 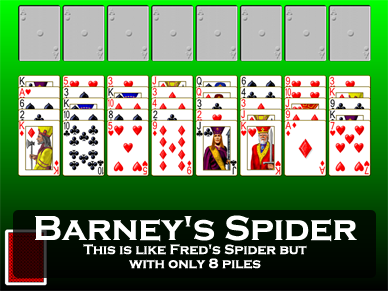 Barney's Spider begins by dealing 5 card each to 8 tableau piles. All of the cards are face up. The remaining cards in the decks are dealt face down to a stock pile. There are 8 foundation piles, which are to be built up in suit from Ace to King as usual. The game is won if all cards are moved to the foundations. In the tableau building is down regardless of suit. 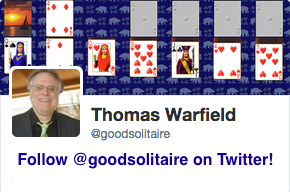 However, you can only move groups of cards if they are in sequence down in suit (this is like Spider). Spaces may be filled by any card or legal group of cards. When you get stuck, clicking on the stock will deal one card to each tableau pile. Since it is a new game, its exact difficulty level is not known, but it is a harder game than Fred's Spider. 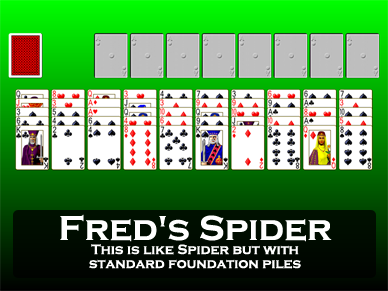 Fred's Spider is the same game except it has 10 tableau piles rather than 8. Barney's Spider will be somewhat harder to win than Fred's Spider average 96% win rate.